The South Pacific is a unique region with some of the most impressive natural wonders that Costa Rica has to offer. Here you will find the Manuel Antonio and Marine Ballena National Park, Chirripo, sites in indigenous areas, the Terraba-Sierpe mangroves, the Piedras Blancas National Park, Golfo Dulce, Osa Peninsula and Corcovado National Park. The South Pacific of Costa Rica offers fantastic opportunities for adventure, sports fishing, diving, surfing, rafting, paragliding, mountain climbing, bird watching, excellent beaches and natural attractions to enjoy. The South Pacific paradise of Costa Rica is one of the most beautiful places in the country and can be reached by transportation companies that offer their services. 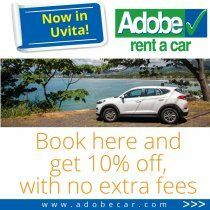 Tavo Tours Uvita is a tourism transportation company in the South Pacific of Costa Rica, offering custom tour packages for people who have the desire to know more of this beautiful country. Star Box de Costa Rica S.A.